Jairus was, of course, terribly impatient of this delay in reaching his home; so they now hastened on at quickened pace. Even before they entered the ruler's yard, one of his servants came out, saying: "Trouble not the Master; your daughter is dead." But Jesus seemed not to heed the servant's words, for, taking with him Peter, James, and John, he turned and said to the grief-stricken father: "Fear not; only believe." When he entered the house, he found the flute-players already there with the mourners, who were making an unseemly tumult; already were the relatives engaged in weeping and wailing. And when he had put all the mourners out of the room, he went in with the father and mother and his three apostles. He had told the mourners that the damsel was not dead, but they laughed him to scorn. 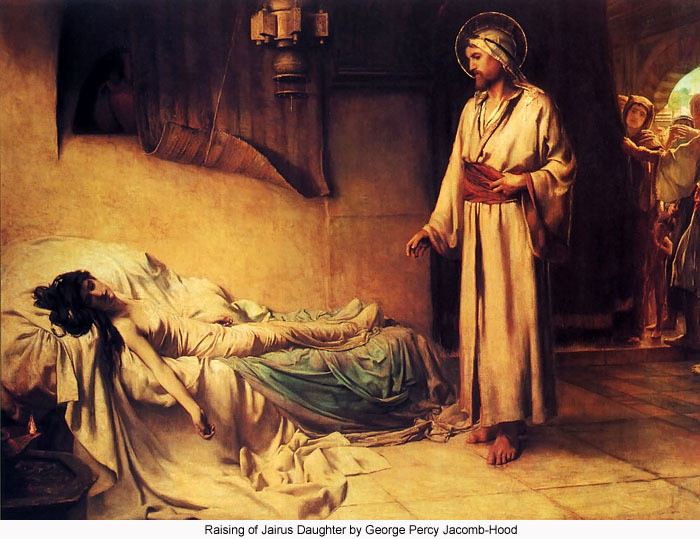 Jesus now turned to the mother, saying: "Your daughter is not dead; she is only asleep." And when the house had quieted down, Jesus, going up to where the child lay, took her by the hand and said, "Daughter, I say to you, awake and arise!" And when the girl heard these words, she immediately rose up and walked across the room. And presently, after she had recovered from her daze, Jesus directed that they should give her something to eat, for she had been a long time without food.